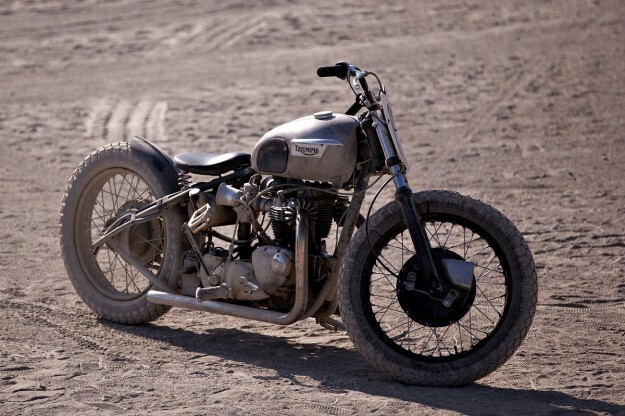 If there’s one style of custom motorcycle that’s always been popular, it’s the mighty hardtail. Reminiscent of the board and dirt trackers of old, the distinct profile of a hardtail motorcycle frame, coupled with the simplicity (or impracticality) that comes with a lack of rear suspension, holds a certain charm for many. While we’ve seen fantastic examples spanning many makes and models, few evoke as much emotion as those built around British engines of the 1960s and 1970s. 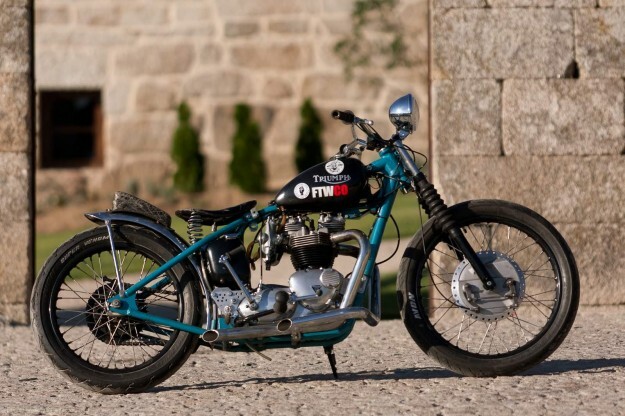 So, for today’s selection, we’ve decided to focus our attention on Triumph hardtail motorcycles. 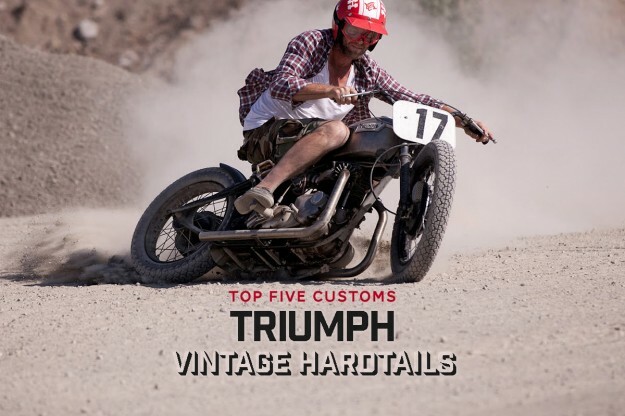 These are our five favorite vintage Triumph hardtails—a rather eclectic mix of styles, so let us know if you agree with our choices. Falcon Motorcycles Kestrel This was the second motorcycle in builder Ian Barry‘s ‘Concept 10’ series. At its heart is a 1970 Bonneville engine, which originally came with a damaged gearbox. Ian cut the unit-engine in half, ripped out the damaged transmission and installed the gearbox from a BSA A10. He then re-shaped the engine’s contours by aluminum welding new pieces and fitting them using a jig, and CNC machined new 750cc cylinders out of aircraft-grade aluminum. Only ten inches of the original frame remains; the rest was fabricated from high-tensile steel tubing and set in a custom-made aluminum jig, to ensure accurate geometry and flawless alignment. In fact, most of the Kestrel was created in-house from scratch—from the girder forks right down to the gas and oil tanks, exhausts, handlebars, seat, levers and fender. 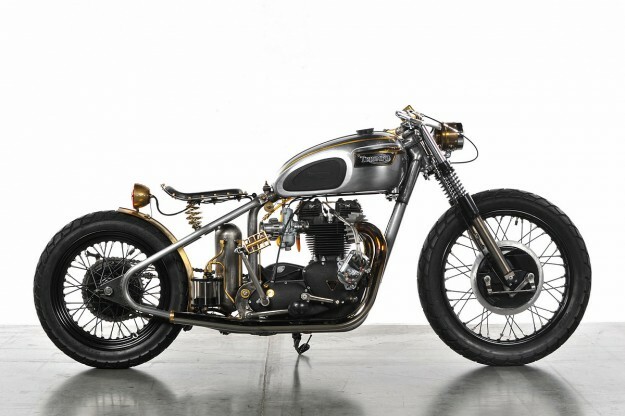 Analog Motorcycles T120 ‘El Matador’ This T120 Bonneville is what happens when a respected builder creates a bike for himself. 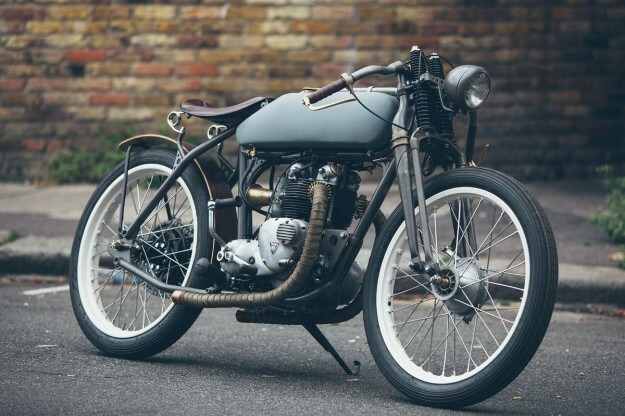 ‘El Matador’ was a two-year labor of love for its owner—Tony Prust of Analog Motorcycles. 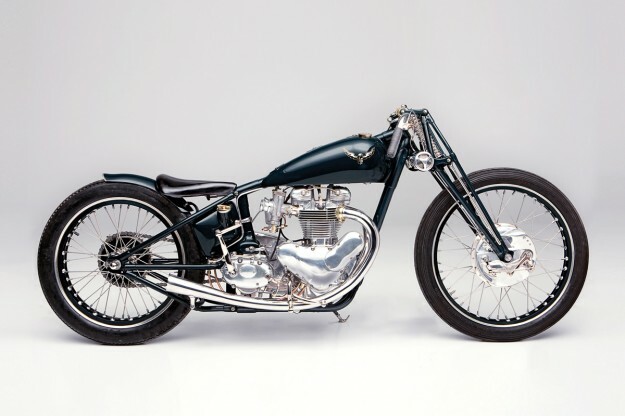 The basis of the build is a 1968 Triumph frame with a Dave Bird bolt-on hardtail. It’s powered by a 1972-spec 650cc T120 motor, rebuilt by Ed Zender of Triumph specialists Morrie’s Place and powder coated wrinkle black. Mods include Maund velocity stacks, pipes from Lowbrow Customs and a belt drive primary from Bob Newby Racing, with an open cover designed by Tony and Ed. The forks are from a late ’60s BSA, hooked up to a twin leading shoe hub laced to a 19” rim. The rear rim is a 16” Harley unit on a conical hub, and the tyres are dual-sport Kenda K761s. A full rewire was done on the bike, with a new Joe Hunt magneto installed as well. David Borras’ T120R Before David Borras established El Solitario, he commissioned this cheeky hardtail for himself from Californian shop Hell On Wheels. Despite preceding any of El Solitario’s own builds by about three years, it’s just as kooky and audacious as what we’ve come to expect from the Galician outfit. The starting point was a matching numbers T120R Bonneville. Hell On Wheels completely rebuilt the engine and fitted it to a hardtail frame, with Amal monobloc carbs, a QPD open belt drive and a Boyer Bransden ignition. The rims are from Borrani—21” front and 19” rear—with Avon race tires and a ’71 Triumph twin leading shoe drum brake up front. The tank and rear fender are classic Wassell items. Image by Vincent Prat/Southsiders MC. Untitled Motorcycles T100 SS This board-track inspired hardtail is something of a departure for London’s Untitled Motorcycles—but there’s plenty to love. Its owner, who had been looking for a board-tracker, found it as a partially completed project at the Veterama Oldtimer Autojumble in Mannheim, Germany. The frame had already been modified and the basic stance sorted—including original Harley ’45 springer forks, Avon tyres and an Indian board track tank—but a lot of work still had to be done. It had no foot pegs for one, and most of the brackets were only tack-welded. Image courtesy of Andre Silva. Eastside Bobber I’m a sucker for any bike that looks single-minded—and this dirt-tracker from the French outfit Eastside nails it. Its owner is a BMX rider who runs a surf-and-moto shop in Toulouse; he wanted a hardtail Triumph bobber and would originally have sent the project to the USA, until Vincent Prat of Southsiders MC convinced him that it could be done in France. The motor, forks and hubs were sourced from a T120, before the motor was completely rebuilt by engine guru Henri Lao Martinez. Factory Metal Works in the USA supplied the frame, and local custom builder Momo took care of installing the motor. The bike was then stripped to the bare basics and fitted with 19” (front) and 18” (rear) rims, shod with Dunlop K70s. As a nod to the owner’s lifestyle, a beat-up Shimano BMX pedal has been installed on the kick start lever and the chain now rolls on a Powell-Peralta skateboard wheel.